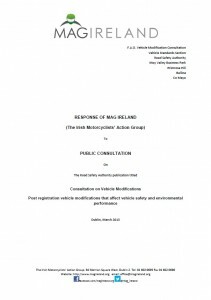 Back in March, MAG Ireland issued a formal response to the RSA on their Consultation on Post Registration Vehicle Modifications. The RSA had invited submissions from vehicle owners, road users, interest groups and members of the public and in keeping with policy, MAG Ireland responded on behalf of Irish riders. The consultation document made clear that the RSA had already decided some method of control would be put in place to deal with modifications to vehicles after they were registered for use on the roads. It therefore asked a deceptively simple question. Should vehicle modifications be self-declared by the vehicle owner, or should there be some sort of formal of test to check and approve modifications? We in MAG Ireland had a number of concerns with the document which we addressed in our response to the RSA including the fact that the definition of a modification was excessively broad and would cover much of what we as riders would consider to be accessories rather than modifications. Our reservations notwithstanding, we made a concerted effort to engage with the RSA as part of the consultation process and our views were duly recorded. Our submission is now available for download from the link below.